1. Preheat the oven to 180˚C, gas mark 4; grease and line a 23cm loose-bottomed cake tin with baking parchment. Using electric beaters, beat the butter, sugar, lemon zest and spices together. Add the eggs, one at a time, then beat in the flour. Fold in the grated apple and sultanas, then pour into the tin. 2. 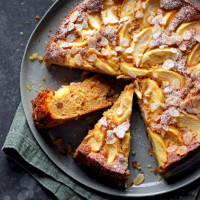 Arrange the apple slices on top of the cake, scatter with the almonds and bake for 65-70 minutes. Cool in the tin for 20 minutes before serving.